I loved making this Bon Voyage step card. I visualized the whole thing before even beginning. The steps really lend themselves to the different levels for the waves. But the star of the show is that huge cruise ship in the back. Finished card size is 4-1/2"x6". Two back steps are covered in water paper. Love this paper; it's so realistic. All cuts on the card are done with Life Is A Beach cart. The ship was cut twice, once in blue vellum for porthole windows, once in pearl white (Gemstones) for top deck. The hull of the ship was cut from thick "aluminum" CS. This stuff is amazing. I use it for a lot of cuts that need to look like steel or metal. It looks and feels like brushed aluminum. Ship 2-1/2, palm trees 3-1/2. 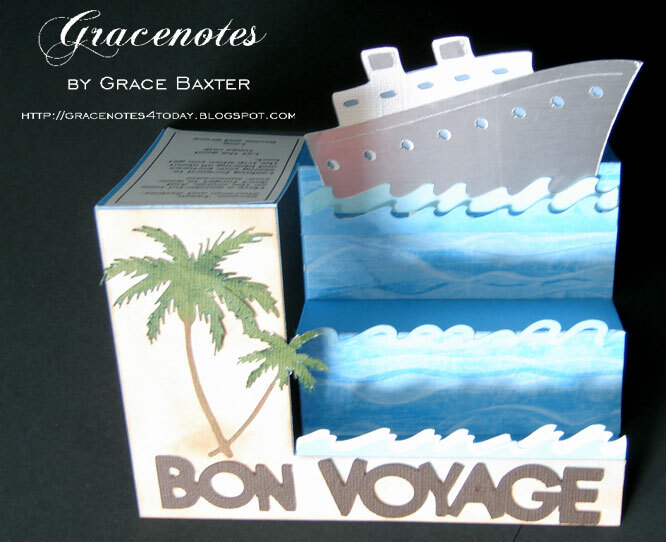 For "Bon Voyage" I cut the phrase and then snipped off the attached ship that goes with it. The remaining words happened to fit exactly within my one-inch beach front. Sometimes in cardmaking I am amazed to discover little things that can only be described as "meant to be". 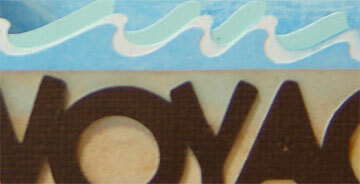 An example of this is the length of the waves. I was expecting to have to use my Gypsy and resize the wave lengths to make them fit my 4-inch side steps. I did a test cut (as always) and found that they were the perfect length! Also, something funny happened. Funny-strange, not funny-haha. When I tapped "cut" on the Gypsy, the waves came out as a silhouette. Not sure how that happened but I like the variety of waves. The closeup pics above and at right illustrate what I mean. 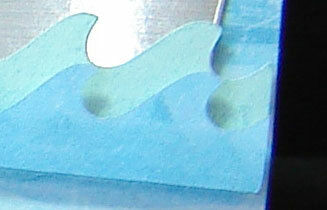 The waves closest to the ship are layered to look more realistic, using pop dots to separate them. I also did a lot of sponge painting over and around the waves to make these pieces blend into the picture more. I cut one continuous piece for the tall left side and the front of the first step. Pretty easy to do by measuring carefully. Then I sponged and dabbed brown ink over the piece, creating sand divets. 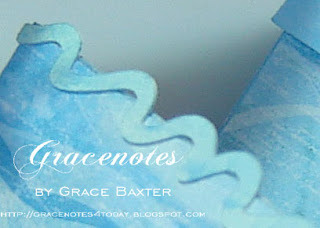 For water on the beach I sponged blue ink lightly in a wavy fashion over the sand at the edge. I prepared a personal message and attached it to the back of the card. You know, I think I might make one or two more of these to have on hand. Surprisingly, it didn't take that long to make and I think the result was pretty showy. The recipients loved it! Added Note: As soon as I published this blog and went back to check on it, Google had placed a cruise ad next to my entry. I thought that was pretty cute. It made my card that much more believable. Fun! 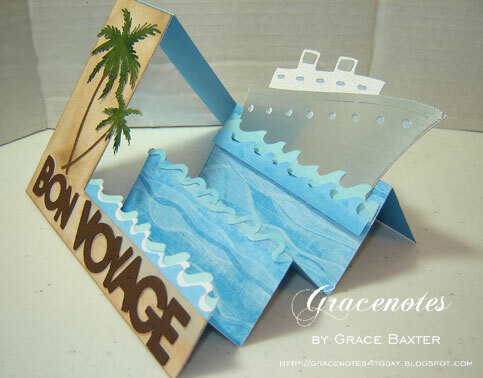 Update January 18, 2018: My "Bon Voyage" cruise ship card has popped up all over the Internet, hundreds of times since its first posting on April 2, 2011. PROOF that a good design will last forever! Thank you, followers and viewers for enjoying it and for passing it on, over and over again! Oh my...this card is wonderful! Makes me want to pack my bags and wait for this ship to pick me up...if only...sigh... Great card! 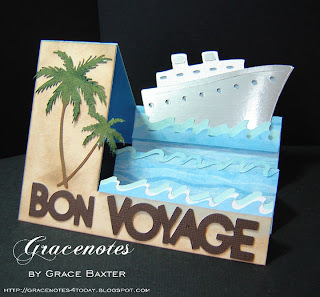 Hi Grace, This card is just gorgeous. My MIL is going on a cruise in 2 weeks (and I'm heading back to hospital with Alyssa on Tuesday) so I hope you don't mind if I scraplift this to save some time. It's great. Thanks for sharing. AWESOME !! 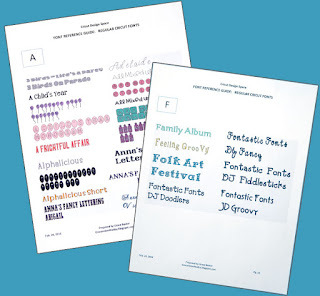 Love the paper ! You really did a great job ! Thank you very much. I love step cards. Your card is absolutely gorgeous thanks for sharing. When I first set up my blog I did it all wrong and when I tried to fix it it threw everything off. Super adorable card. Thank you for stopping by my blog and becoming a follower. I too now follow you. This card is popping all over the Internet! I had to follow the link and leave a comment. So beautifully designed, and thank you for sharing so many details on how you made it! Great job.